Cooking With My Food Storage: Where do I start? For those new to food storage and those that are looking to bulk up what they already have I recommend the Shelf Reliance Q. 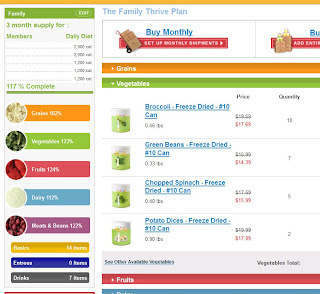 This is a free customizable program that helps you purchase food storage consistently. For my family building our food storage has been all about consistency. We have made a few large one time purchases but the majority of our food storage has been built up slowly over time, as we purchased a little each month. The program is pretty straight forward, working much like the Netflix Q. 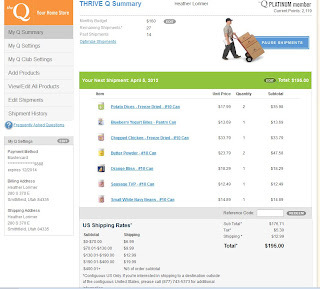 You create an account, then choose products you want in your food storage (or the computer can help you create a food storage plan for your family). You set a budget and purchase the products on your lists, a few each month staying inside your budget. There is no additional charge and you only pay for the product you actually buy (and of course the shipping and tax). And for my family it was. I started with a modest Q order each month. I would purchase some items we needed for our food storage and they would be shipped directly to my home. Opening the box was like Christmas. My kids run to the door to get the package from the Fed Ex man and then we open it together. They even help me put the cans on the shelf. I love it. It is really food storage made simple. We have now been ordering our food storage through the Shelf Reliance Q program for about two and a half years. I like how easy it is to consistently be building my food storage. How by ordering consistently we have been able to build a large food supply for our family. I like how easy it is. Set it up once (takes 5 to 10 minutes) and then just let it go. I like that it is customizable. I don’t have to order lima beans or TVP, which we hate. I am in complete control of my orders each month. I like the reminder e-mail I get about 7 days before my order is ready to ship that reminds me to check my order and make any changes I need to. (I’m pretty fickle so I always make changes). I love that it ships directly to my door. I like that I always get the best price. No coupons, no hassle. When initially setting it up it can be a little “clunky” navigating you away from where you want to be. When initially setting it up it is hard to know when you are finished. (You are finished when your Q shows a ship date in the green bar “Your next shipment: October 9, 2012” or whatever date. When adding products to my Q sometimes I click on the wrong button and they get added to my card instead of my Q. 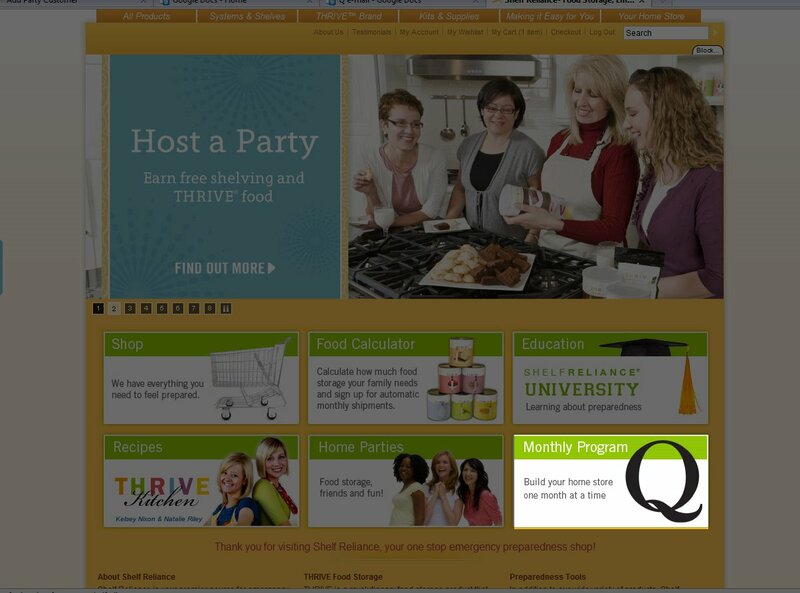 To avoid this look for the Blue “ADD TO THRIVE Q” button. Q shipments come in boxes that are clearly marked that they are from Shelf Reliance. If you are very secretive about your food storage and don’t want anyone to know this might bother you but for my family my neighbors are too busy with their own lives to notice what packages get delivered to my house. How to Set up Your Own THRIVE Q. 1. Visit the Q home page. 3. Scroll to the bottom of the page and choose between. “How much do I need in my home store?” and “I know what I want let’s shop!”. If you choose “How much do I need in my home store” you will then be asked to answer some simple questions about the number of people in your home, their ages and genders (you don’t have to enter their names if you don’t want too). This will help the program design a customized food storage plan for your family. When you are finished with the questions click “View My Plan” and you will see a customized food storage plan. If there is anything you want to add, remove or change it can easily be done. This is what a food storage plan looks like. I LOVE how easy it is to customize to my family. When you are happy with your plan then click on the “Buy monthly” button at the top of the page. Begin Shipments—You now have your Q loaded and you need to begin shipments. Set your budget by clicking on “edit” next to monthly budget at the top of the page. Select the level of Q club you want. Enter you billing, shipping, and payment info. 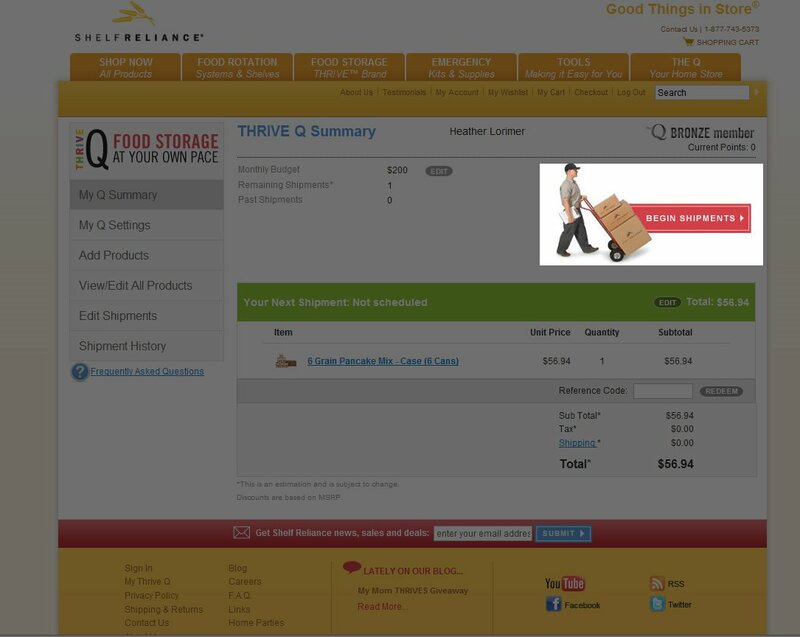 Success—when your Q shows in the green bar “Your next shipment: October 9, 2012” or whatever date. You know you did it correctly. You will be able to choose the items you from a list. Just enter the quantity you want. 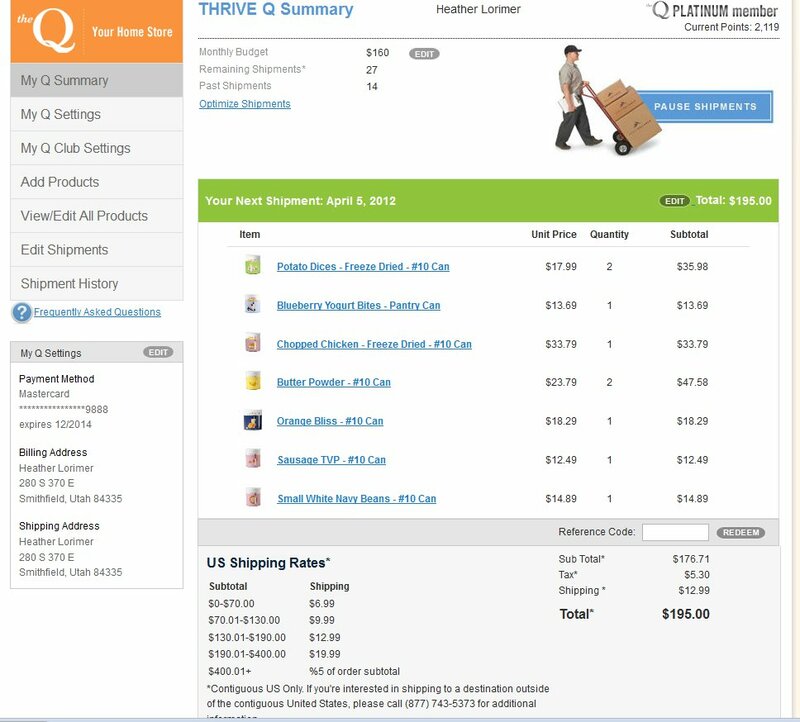 After clicking through all the food groups click the blue button at the bottom of the screen “Add to THRIVE Q”.